One thing we strive for day in and day out at The Savvy Scot is to help you save money. And often, we find out readers forget about the big pictures. Sure, it is great to stop buying clothes for a month, it may leave you with an extra £100 in your pocket at the end of the month. But what about saving THOUSANDS? Take your mortgage, for example. If you have a standard 25 year, £140,000 mortgage at 4% interest, overpaying it by just £50 a month could help you save £9,432 in interest! And shave off 2.5 years of repayments. What I did with my mortgage, after checking my lender wouldn’t charge me anything for making overpayments, I put every little bit of extra money I had towards it. I used to pay £600 in rent before buying my own place. Now, my mortgage is £520. I kept paying £600 at the beginning of each month, since I was used to paying that much anyway. If I saved £10 by cycling instead of taking the train over the weekend, I’d send the money to my mortgage. Found a fiver on the floor? Mortgage. You just need to check the terms and conditions of your mortgage, as some providers have a fee per payment, and others may have a limit on how much you can repay every year. Mine didn’t, so I could even make a £1 payment if I so desired. Within two years, I had overpaid by thousands extra, and shaved off about five years from my mortgage term. .
As I mentioned above, little amounts do add up. £50 a month is not even £2 a day! How could you find room for an extra £50 in your budget every month? Easy. First, start by doing a thorough analysis of your spending. Is there anything you are spending on that doesn’t bring you value? It could be that you are still paying for a bus pass but now own a car. Or that you have a gym membership you haven’t used in six months. You can also do a quick online check to make sure you are on the cheapest utility tariff and internet bundle. I do that once a year and these two checks save me over £150. That is three months of mortgage overpayments right there! Without affecting your lifestyle. Once you have done so, look at other areas where your spending could be improved. Are you throwing food away? Buying magazines you don’t read? Again, stop spending on things that are not of value to you. The value of something can be very different to every person. So make a list of your priorities and spend accordingly. My priorities include travel and good eats. As a result, I don’t mind spending next to nothing on clothing or tech gadgets. If you tighten the belt on everything, you will feel deprived and unhappy. But if you manage to identify those little daily budget busters, you may save a lot without feeling the pinch. And last but not least, think about your end goal. How awesome will it be, a few years from now, to be mortgage free? Maybe you’re just getting started in life, and paying a mortgage until age 55 isn’t too scary. But soon you may have a partner, some kids, a family to support, and being able to live without a mortgage would help you put your money where it really matters: to buy quality time with your loved ones. 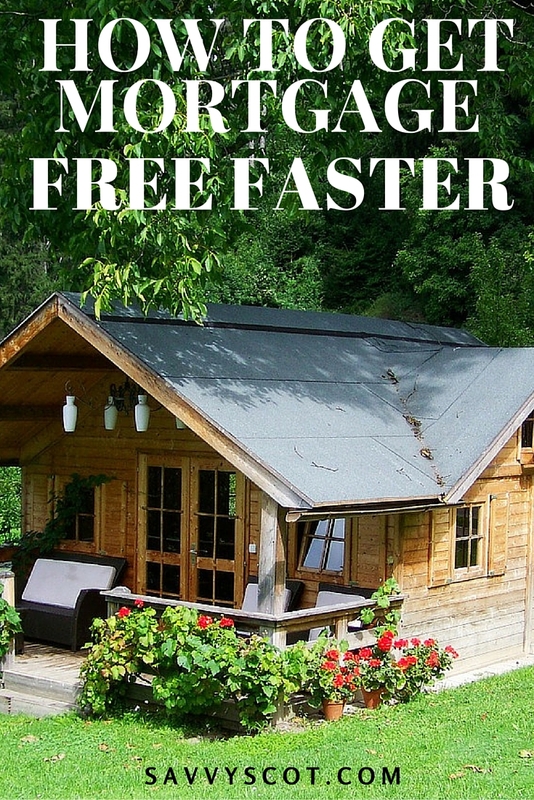 Check out the Mortgage Free Faster hub from Bank of Scotland for more information.